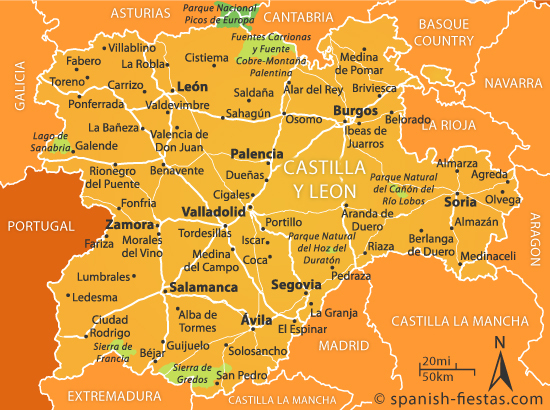 There are nine separate provinces in the autonomous region of Castilla y León, making it Spain’s largest region. An amalgamation of the former regions of Castilla la Vieja and León, some of Spain’s most fabulous Heritage Cities can be found here. The nine provinces which make up this region are Avila, Burgos, León, Palencia, Salamanca, Segovia, Soria, Valladolid and Zamora. Castilla y León is located between Madrid and the Portugese border and, apart from Burgos, which is in the Ebro Depression, most of the region is part of the lower northern plateau. The Iberian mountain range crosses the north of the region with the ‘Sistema Central’ range in the southern section. The plateau lies basically in the middle of these mountain zones. The most important river is the Duero, with its source in Soria, along with the Tietar and Alberche, which are tributaries of the Tagus. These rivers enter the Atlantic in Portugal. The development of tourism in this region has had a tremendous impact on the economy, providing employment for the many people migrating from the countryside to the capital cities of the provinces. Agriculture is still important, including wheat, sugar beet and potatoes alongside animal husbandry and forestry in the mountainous areas. Salamanca and Zamora provinces generate more than 25% of Spain’s hydroelectricity. Castilla La Vieja was so-named because of the many castles built there in the eighth and ninth centuries (more than 300 in total) by Christians in their defence against the Moorish invaders. One of Spain’s most celebrated heroes, El Cid el Campeador, was born near Burgos and is buried in the magnificent 13th century cathedral there. In 1218, the golden city of Salamanca became the home of Spain’s oldest university. Even before these times, though, Atapuerca, near Burgos, was the site at which fossils from the earliest known hominids in Europe were discovered, along with stone tools dated at more than 780,000 years old. 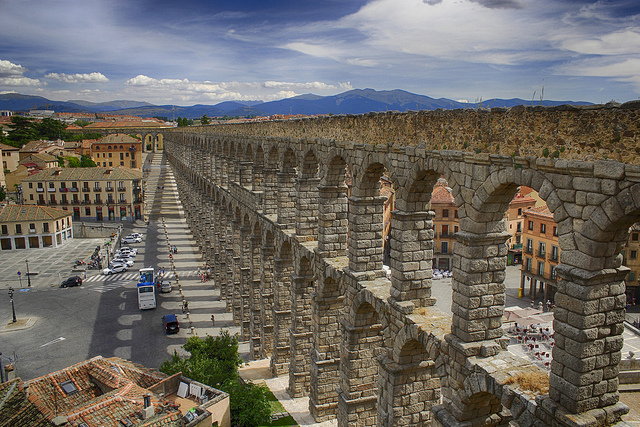 Segovia, as well as being home to the castle which reputedly inspired that in Walt Disney’s Snow White, also boasts an incredible 2,000 year old Roman aqueduct which is one of the best preserved in the whole world. Constructed with 20,400 stones, it was still supplying the city with water during the 20th century. Another fascinating Roman site can be seen at Las Medulas near León, where they devised a method of employing hydraulic power to help mine for gold. Other interesting historical footnotes concerning the area include the history of Valladolid, which was an insignificant village until the eleventh century but then became the home of the Kings of Castilla and capital of the Kingdom of Spain until 1561 and then again from 1601 until 1606. Castilian Spanish dialects started to develop during Alfonso X’s reign in the 13th century. Alfonso, the learned, encouraged, from his base in Toledo, scholars to write works in Castilian and also to translate the major religious, scientific, historical and literary texts into the language. As the catholic kingdoms began to dominate Spain, the language spread until it was declared to be the national language by Ferdinand and Isabella. The publication in 1492 of Antonio de Nebrija’s ‘Arte de la Lengua Castellana’ was a key moment in time linguistically. It represented the first textbook which attempted to define the grammar of a language in Europe and helped cement the importance of Castilian Spanish. There are, however, some residents of León, Zamora and Salamanca who continue to speak a Leónese dialect of Castilian. Whilst there are small airports in Salamanca and León, they only deal with a few domestic flights. For international visitors the best port of entry for discovering Castilla y León is Madrid from where the region is most accessible. All of the provincial capitals have regular and fast train services from the capital and the high speed AVE service links Madrid with Valladolid in just 65 minutes. There is also a network of excellent roads criss-crossing the region, including the main roads from Madrid to the north and north west coasts, the A1 and A6. As in all of Spain, local bus services enable you to visit the smaller towns easily and cheaply, in air-conditioned, modern buses. Climate: The region is notable for its very hot, short summers and quite often bitterly cold winters; in fact, locals claim, only partly in jest, that the climate in Burgos is ‘nine months of winter followed by three months of hell’. Rainfall in the central lands can be between 400mm and 600mm whereas in the mountains it is far higher, with snow often permanent. Festivals: The Easter celebrations at Valladolid are famed throughout Spain, notably the Good Friday procession in which 28 elaborately crafted tableaux are paraded around the town. In June at Manrique in Soria, there is a traditional fire walking festival in which you can redeem your sins. Be careful, though, as apparently only locals can do this safely. One of the most colourful spectacles of them all is the El Colacho Festival at Castillo de Murcia near Burgos. This takes place on the Sunday after Corpus Christi and involves a man jumping over mattresses on which babies are lying. This prevents them, bizarrely, from not only illnesses but also getting hernias – presumably he has them all instead! There are also lots of bull runs such as at Ciudad Rodrigo near Salamanca in February and Cuellar near Segovia in August. Zamora is a medieval town of great beauty with some fine Romanesque churches, a cathedral with an impressive Byzantine dome and the eighth century Visigothic church of San Pedro de la Nave nearby. Also quite close is Spain’s largest lake – the glacial Lago de Sanabria. 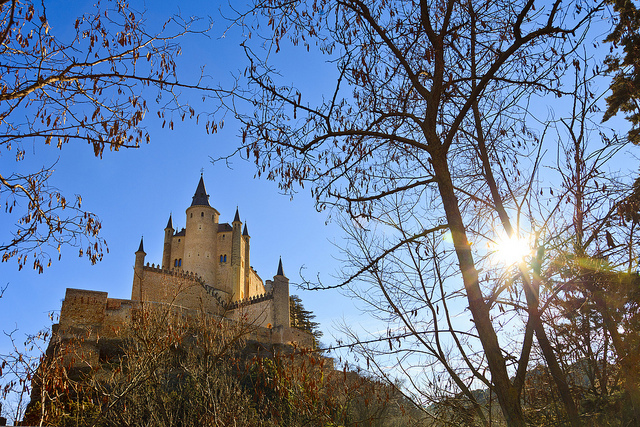 Segovia is one of the region’s six World Heritage sites and it’s easy to see why as you approach the Alcazar standing on its hill. It also has Spain’s newest cathedral (built in the sixteenth century) as well as the Roman aqueduct and a fascinating old centre. About 9 miles away from Segovia are the castle and, especially, the gardens of La Granja de San Ildefonso, Felipe V’s attempt to emulate the Palace of Versailles. Ávila is completely enclosed within well-preserved Romanesque walls built in the eleventh century, it is another of the World Heritage Sites. 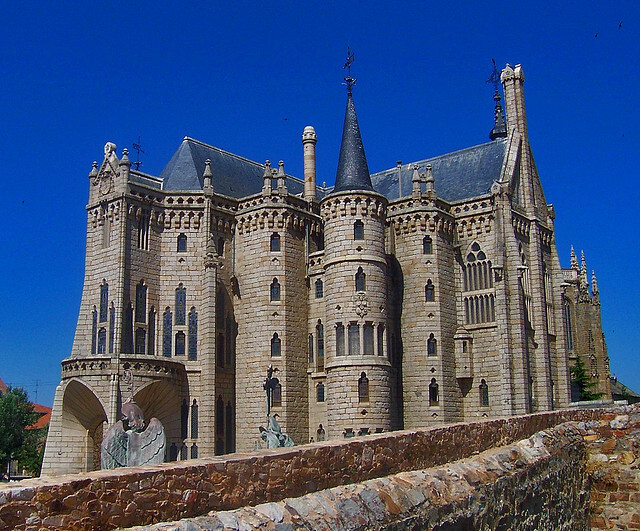 Famous for being one of the coldest cities in Spain during the winter, Ávila was the home of Saint Teresa and there is a museum here in what was originally the first convent she established. The city walls are spectacular, with 90 towers and numerous arched gateways and are attractively illuminated at night. Perhaps the best viewing point to appreciate the city is on the road to Salamanca at Los Cuatro Postes. Salamanca has a history stretching all the way back to Hannibal, who besieged the city, but since the Middle Ages it has been one of Spain’s leading universities, attracting students from all over the world. Unusually, it has two cathedrals standing adjacent to each other as well as a Plaza Mayor which is arguably the most attractive in Spain. Much of Salamanca’s visual appeal is because of the attractive golden stone of which the buildings are built. Because of the high number of students here, the atmosphere in Salamanca is distinctly livelier than in many of the region’s other provincial capitals. Burgos is yet another of those delightful old towns to wander around and discover. The extravagant Gothic cathedral, one of Spain’s largest, and a fabulous art gallery at the end of the Puente de Santa María, which crosses the atmospheric Río Arlanzón, are special highlights of the city. There is a statue of El Cid, whose tomb is given a prominent position in the cathedral. Because of the strategic position of Burgos on the Camino de Santiago, it is a very popular resting place for walkers heading north to Santiago from Madrid. Atapuerca and its glimpses into the beginnings of mankind is just a few miles from Burgos. León used to be the region’s capital city, it has a cathedral worth seeing for its stained glass windows alone, but also has a much more modern, Gaudi designed, Casa Botines. The Basilica de San Isidoro has a series of Romanesque frescoes in its crypt and another building you can get a close look at is the Renaissance San Marcos monastery, which is now a Parador hotel. Soria and Palencia aren’t perhaps as popular or outstanding as other cities in Castilla y León but they do have their share of outstanding architecture. 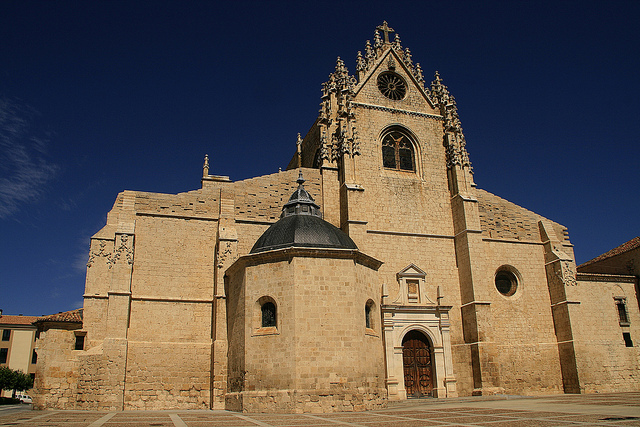 Most notable is the cathedral in Palencia which justifies its nickname of being ‘the unknown beauty’. Valladolid was for a time home to two of Spain’s most famous residents. Consequently, the houses of both Cervantes, who was imprisoned here, and Columbus, who died here, are both open to the public. There are also some excellent museums here, especially the one devoted to sculpture, and it’s a city well-known for the quality of its cafes and bars. This is one of Spain’s most historical and cultural areas and those visitors interested in all aspects of archaeology and architecture will likewise find Castilla y León a paradise. In addition, the Camino de Santiago passes through the area and can be followed as a ‘trail’ and there are also a good number of vineyards and vineyard tours. Additionally, however, Castilla y León has become one of Spain’s premier activity holiday areas. The mountain areas, for example, are popular with snow sport enthusiast, being very popular with snowboarders and cross country skiers. Although this is an inland region, there are many excellent fishing areas and also many places where canoeing, water rafting, sailing and gullying all take place. Horse riding, pot holing, paragliding, ballooning, hang gliding and climbing are all possible outdoor activities enjoyed here. There are twenty golf courses in the region, probably the best of them being that at Villamayor; it’s certainly the longest and most difficult. If that all sounds a little too hectic then you’ll be delighted to learn of the region’s gastronomic delights. Meat dishes are especially well-known from this region. Suckling pig, baby lamb and some tasty chorizo sausages will feature on most menus, along with perhaps roast goat (cabrito asado), blood pudding (morcilla) and wild boar (jabalí). The predominant wine regions of Castilla y León are the Ribera del Duero, Rueda and Toro regions. There is everything here from young and lively, fruity red wines all the way through to the most sought after ‘reservas’. There are, accordingly, many Wine Routes throughout the region, highlighting many of the better known vineyards. As well as wine, high-alcohol content licorosos and aguardiente brandies are popular here. Have you Been to Castilla y León? If you’ve done any touring in Spain there’s a good chance that you’ve touched upon this largest of Spain’s regions. Any anecdotes and recommendations to fellow visitors will be most welcome in the comments section below. Such a beautiful area. I hope to visit it someday in depth. Thank you for providing these invaluable resources for those of us who love Spain. Very good read Salamanca area. I have not been to north spain. This weekend my wife and I are spending two weeks in Calpe We hope to find some interesting places to visit. Thanks for your Emails I always enjoy the read. I visited the area in April of this year and was fascinated and rewarded with a wonderful part of Spain and was pleased with the food, architecture, history and wonderful wine I would happily return to see more of this part of Spain. Another well written Travel Guide Gerry. Brings back great memories of our own visits to the area over the years. Segovia, Avila, Burgos, you name them, absolute gems! Always hoping to return and spend more time there, shouldn’t be missed by anybody. Valladolid, Zaragoza, Salamanca are all lovely. Its nice to go to the little towns and villages too. My grandfather was from León . I hope one day to visit my ancestors land it looks beautiful but I also must have family . My surname is de Prado . Very Spanish indeed . Am currently staying in The Parador Lerma and exploring nearby. 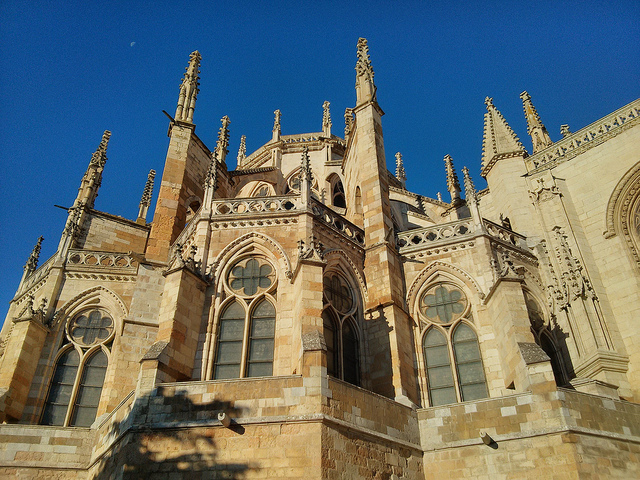 Saw Burgos Cathedral yesterday – WOW!